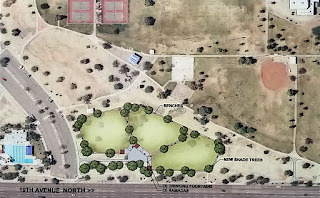 One of the larger neighborhood parks in North Phoenix is Deer Valley Park, located at 19th Ave and Wahalla Ln., just south of the Loop 101 Agua Fria Freeway. The 38-acre park offers amenities including a Community Center, public pool, tennis courts, and playground equipment. 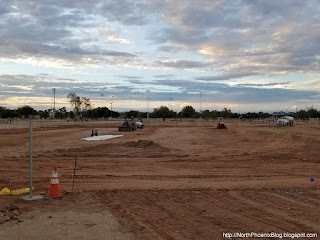 But recently, a new project has begun at the park. An unused section of Deer Valley Park has been fenced off and construction crews are hard at work building a new Dog Park! The funding was approved in a 2008 measure called the Phoenix Parks and Preserves Initiative. When completed, the new dog park will have 3 one-acre pens with grass, shade trees, and benches. There will also be a new ramada with drinking fountains and lighting installed. Construction is expected to be completed in Fall 2017. Based on other dog parks, I presume that the three pens will be designated for small, medium, and large size dogs. Below is an artist's rendering of what the completed dog park pens will look like. This is another great feature that will make Deer Valley Park a valued asset to the community and to the North Phoenix area.